NEW YORK, NY -- (MARKET WIRE) -- May 16, 2007 -- Digital publisher Serious has been swiftly taking the US gift card market by storm in taking a quantum leap from plastic gift cards to its digital format of the interactive DVD Card™. This industry pioneer and intellectual property owner has been commissioned by Circuit City to produce their second interactive DVD gift card program, featuring powerful Disney content from the imminent studio release; "Pirates of the Caribbean: At World's End." With the gift card market already generating a massive $76 Billion in 2006 (source: NRF - National Retail Federation), the dual-functionality (DVD and DVD-ROM) interactive gift cards are probably the most exciting innovation to hit the market to date, and are perfectly timed as the industry looks for inspiration to generate the next spike in revenue. Not only do the cards store currency as standard, but they actually 'gift' superb interactive content that will play on DVD players, and Win/Mac drives as well as the gaming consoles, PS2, Xbox and Xbox 360. The functionality of the cards allows them to become more central to a retailer's overall marketing strategy too, opening up two-way dialogue with consumers which can be used to gain feedback to best serve customers. The gift cards can also promote relevant merchandise for redemption against, and can drive purchase online via embedded hyperlinks. These developments mean that the modern gift card has been fast tracked from the role of static transactional device to an exciting interactive brand experience, offering a competitive advantage in what is increasingly a crowded market. Serious has teamed with Circuit City and Disney to create the themed interactive DVD gift card that will be available at all Circuit City stores and online at circuitcity.com in correlation with the theatrical release of "Pirates of the Caribbean: At World's End." Combined with outstanding content from the movie, the DVD gift cards will also contribute to the studio's large scale marketing campaign by teasing its release, (each card carries the movie trailer), as well as having the potential to go on to become limited edition collector pieces in their own right. Indeed with a play time of around 15 minutes, "The Pirates of the Caribbean: At World's End" DVD gift card is a fully loaded experience, carrying superb movie assets (in addition to the trailer), including free "Pirates" downloads, (a wallpaper and fun templates for foldable models), an exclusive "Pirates" aptitude test, (so users can determine their rank on the ship), and Web links to purchase related movie merchandise, (eg. "Pirates of the Caribbean" video games for all consoles, available in Circuit City stores). "Serious' interactive DVD gift cards make for a very compelling offering and experience, and we hope that they will subsequently encourage consumer loyalty," commented Mikel Freemon, Snr Account Manager at Serious. "We are delighted to help bring the swashbuckling world of Captain Jack Sparrow and his ship mates to Circuit City's treasured gift card customers. As the future is deemed to be digital, the interactive design and creative approach of the 'Pirates' gift cards' content is well equipped to both entertain the gift card receiver, as well as help impact redemption cycles in store, drive traffic online, and accelerate brand awareness and identity." Indeed the DVD gift cards look and feel like standard gift cards, with a magnetic stripe on the front that swipes at the point of sale terminal. However the PET (standard PVC surface) is bonded by a special technique to the DVD part on the underside, which additionally has a protective coating on it to resist scratching. The payment card data is held on the top and the DVD side holds 180 MB of content. Only Serious can deliver the interactive DVD Cards, because the seating device which allows the card to function in a DVD tray is protected by over 100 patents which the company owns. "We're excited to team with Serious on this initiative and to be able to offer our customers such a unique and collectible product related to the release of 'Pirates of the Caribbean: At World's End,'" said Dawn vonBechmann, Circuit City's vice president, multi-channel experience. "It's a perfect gift idea for people looking for something fun to give recent graduates, Dad for Father's Day or anyone else with a love for consumer electronics and the 'Pirates of the Caribbean' movies." Statistically, gift cards already have replaced apparel as the gift of choice amongst consumers in the States, and with 66% of American adults buying an average of 4-5 gift cards in 2006 of an average value of $38 each, (source: FirstData, Deloitte), the interactive DVD gift cards are slated to expedite the gift card evolution and cater to an ever increasing demand. 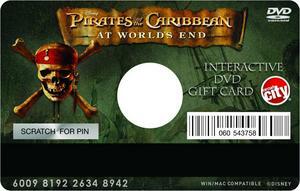 "Pirates of the Caribbean: At World's End" opens worldwide on May 25th 2007, and the Circuit City interactive DVD gift cards will be available in store and online starting in mid May. Serious is an award-winning, privately held digital publisher and marketer with offices in New York, London and Singapore. Its portfolio of intellectual property includes over 100 optical card patents in 60 countries. Applications of its proprietary technology include interactive gift cards, loyalty cards, pharmaceutical patient education cards, direct mail programs and collectible digital trading cards. Serious' clients include BBC Worldwide, Best Buy, Vodafone, Indianapolis Motor Speedway, Disney, Electronic Arts, Circuit City, five of the top 10 US pharmaceutical companies, Manchester United, Sony Pictures, New Line Cinema, Warner Brothers, ESPN and Campbell's. Serious was a recent winner of a Promo Interactive Marketing Award 2007.